This delicious spread is molded and decorated with green onion stems and red chili pepper to give the appearance of a 'gift box'. Stir together first 9 ingredients in a large bowl until blended; spoon into a straight-sided 9 x 5-inch loaf pan lined with plastic wrap. Cover and chill 8 hours, or freeze up to 1 month; thaw in the refrigerator 8 hours. Invert chilled mixture onto a serving plate; remove plastic wrap. Cut loaf in half crosswise; place 1 cut half directly on top of remaining cut half, and smooth sides. Serve with crackers or toasted French baguette slices. Garnish, if desired, by plunging green onion stems in boiling water; plunge stems into ice water to stop the cooking process. Immediately transfer to paper towels; drain stems, and press between paper towels to dry. Press stems into sides of cheese square, beginning with the end of one stem on each side. Bring stems up and over to center of top; form loops with remaining stems, and secure with wooden picks. Arrange chili pepper halves on top. 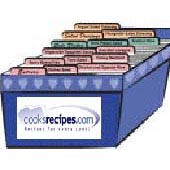 Makes 1 cheese box (24 appetizer servings). Tip: To make 2 small boxes, cut in half, and garnish each half, if desired.